Boy, I go on vacation and the Phillies just go totally sucky against the A.L. East last week. I guess it’s a good thing I wasn’t paying attention to them while I was away, or I would have been in a really foul mood. So what was I doing in the meantime? Here’s the rundown on my recent vacation. First stop was a Sunday afternoon game in Baltimore, with the O’s hosting the Braves for an interleague matchup. Driving south from Philly, the sun came out and it looked to be a beautiful day. No traffic problems, either, so things were going well. Until we got off the exit for Camden Yards, and the ramp split with no indication of which one we should take. Of course, our first choice was the wrong one. It put us onto the street, unable to turn into the parking area. After getting turned around, we thought the problem was solved, but no, we were in the wrong lane to turn into the parking lots, and the road turned back into a ramp which put us right back on 95 South. Aargh! After getting off at the next exit and maneuvering through the cloverleaf of ramps, we ended up heading north again, and this time took the other split after exiting. This dropped us right into the parking areas, but unfortunately these were the “preferred” parking areas, not for us peons. As there are absolutely no signs directing traffic to the general parking areas, we stopped several times to ask various people who looked like they should know. Finally, we finally parked the car and began making our way to the ballpark. Note to Baltimore: better signage would be nice! Fortunately, we had allowed ourselves plenty of time to get there, and still had ample opportunity to get something to eat before the game started. On the advice of She-Fan, Jane Heller, we both got the turkey platter from Boog’s BBQ. They were excellent – thanks Jane! Finally, we made our way to our seats to enjoy the game. Brad Bergesen was on the mound for the O’s, and quickly retired the side to start the game. Derek Lowe, starting for the Braves, was not so lucky. He gave up 7 runs in 2 1/3 innings. The Orioles clobbered the Braves, 11-2. The Braves’ only runs came on a pair of solo homers by backup catcher David Ross, who replaced Brian McCann midway through the game. While walking out after the game, I noticed people pointing at something on the wall of the warehouse building, and taking a picture of it. So of course I had to see what it was. Embedded in the wall is a marker showing where Ken Griffey Jr. hit the warehouse on the fly, shown above right. Wow, what a shot that must have been! Back to the car, then, and we continued south towards Myrtle Beach. My husband has an uncle who lives in Myrtle Beach, and he so kindly invited us to stay at his house. Woo hoo, free lodging! I have to say that Myrtle Beach itself is not quite what I expected, kind of like a southern version of Wildwood, for those familiar with the Jersey shore. But some of the surrounding areas are beautiful, such as Pawleys Island. After some sightseeing, we took in a minor league game at BB&T Coastal Field, between the Myrtle Beach Pelicans and the visiting Lynchburg Hillcats. 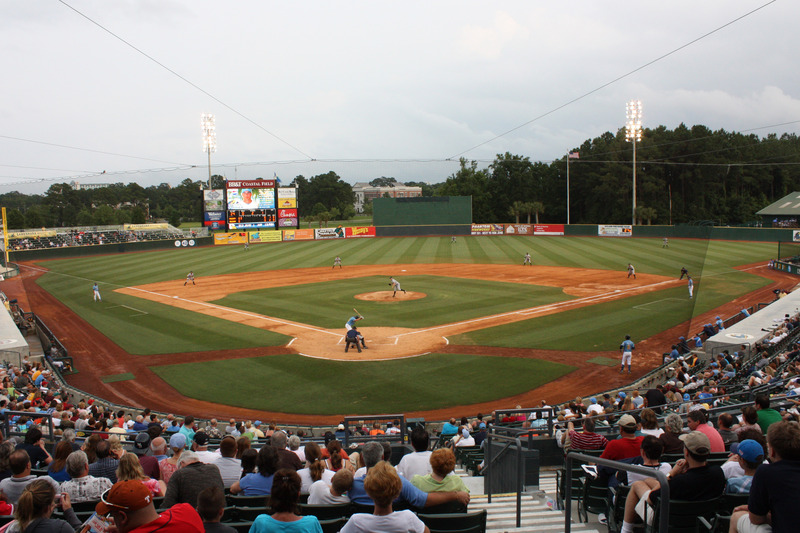 The Pelicans and Hillcats are the advanced-A teams for the Braves and Pirates, respectively, in the Carolina League. The game turned out to be a double-header due to an earlier rainout, and was scheduled to start at 6 pm. But of course, there was a little more rain, and things finally got underway around 7. So I had a little time to wander around and check things out. Game 1 was a quick, well-pitched affair, which was won by the Pelicans, 1-0. 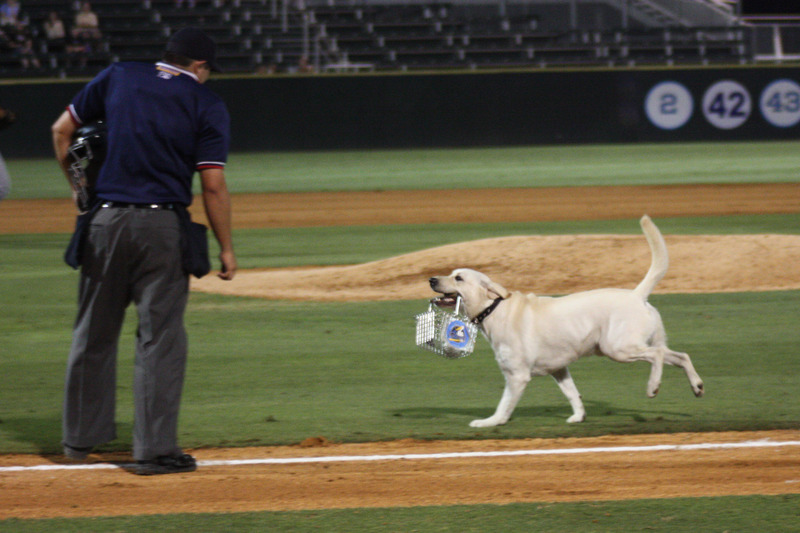 Minor league double-headers are only seven innings per game, and this one clocked in at a brisk 1:59. There was a half-hour break between games, though, so we only stayed for a couple innings of Game 2, since by now it was getting pretty late. The Hillcats took this one, 10-3. The next day we took a drive to Charleston, about an hour and a half south of Myrtle Beach. Charleston is a really picturesque city, full of southern charm, and also very historical. We decided to take a ferry ride to visit Fort Sumter, the site of the first shots of the Civil War. 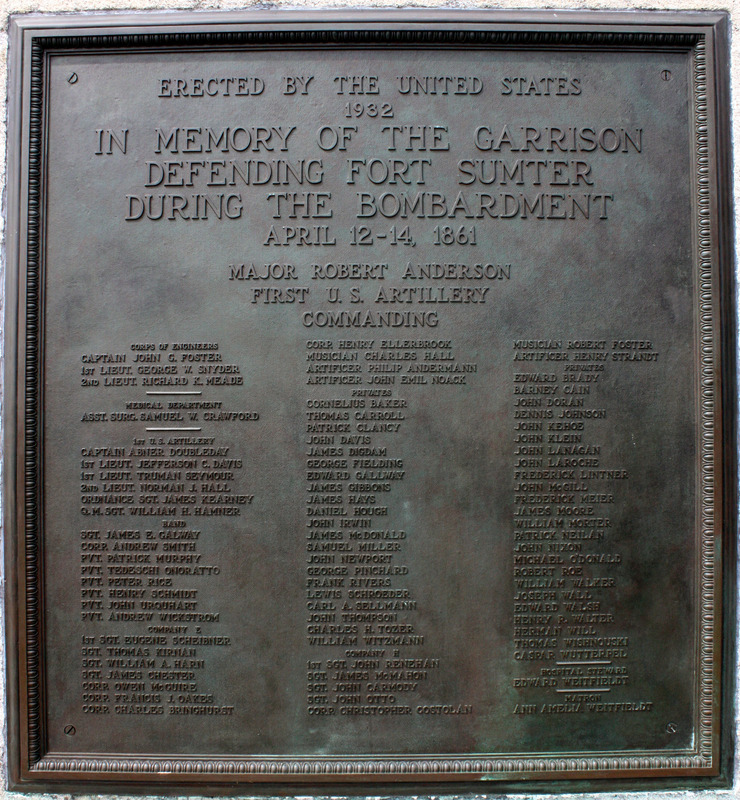 Located at the confluence of Charleston Harbor and the Atlantic Ocean, the fort was ideally situated to protect the port of Charleston from attack via the ocean. Under Federal control in 1861, it was fired upon and seized by the Confederates, thus starting the Civil War. Abner Doubleday, purported inventor of baseball! No, I didn’t stand there and read the whole plaque to find this, and no, I didn’t know it was there. These kinds of things just jump out at me and catch my eye. Though the myth of Doubleday’s invention of baseball has been pretty much disproved, he had a successful military career, retiring with the rank of Major General, having taken part in the battles of Bull Run, Antietam, Fredericksburg, and Gettysburg. Due to the uncooperativeness of Mother Nature, our plans to see a Nationals game last weekend never came to fruition. 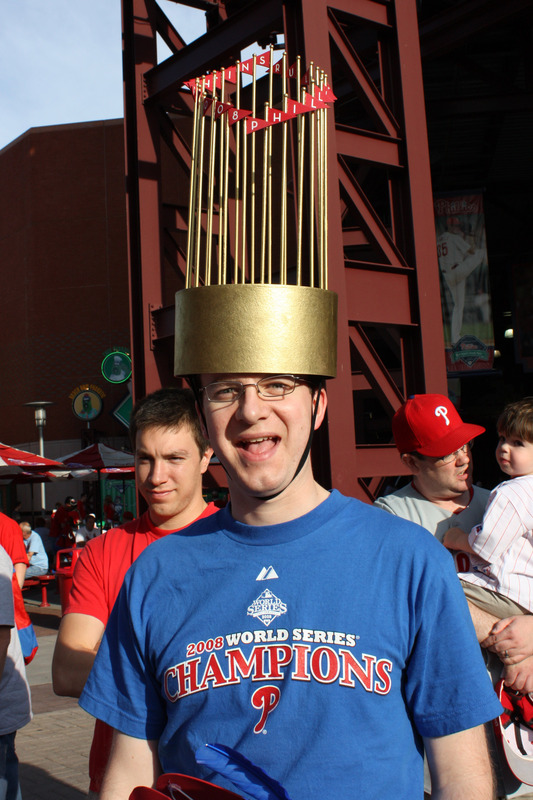 On Monday, we took the kids to the annual Phillies Phestival. For my son and I, it was our fifth time at this great event, but my daughter and husband were Phestival virgins. I warned them to be prepared to wait in lines, but everything went very smoothly. The Phestival is the Phillies’ annual fundraiser to help fight ALS, otherwise known as Lou Gehrig’s Disease. This year’s Phestival raised a record total of $867,670; since 1984 the Phillies have raised over $11 million to help fight ALS. Pedro Feliz – for some reason, Pedro spent much of the time standing rather than sitting. Matt Stairs – he looks like someone who should be fixing my appliances, rather than playing baseball. Jayson Werth – why all the sunglasses on these guys? Jack Taschner – love those twinkly eyes! I didn’t realize he’s actually pretty good looking. Milt Thompson – c’mon Milt, smile! I realized after I’d walked halfway around the concourse that I should have asked him his name, so I could properly credit him here. Always learning! I’ll remember that for next time. Later on, I ran into Jenn from Phillies Phollowers. Always good to run into fellow bloggers! After that, it was time to call it a night, and we headed home with our goodies. My kids are now looking forward to next year’s event already! Yep, until September the kids are home all day. In an effort to keep peace in the house, and keep my sanity, my blogging will be less frequent. But rest assured I’ll be here (just not every day). In my last installments, we had visited San Francisco and Oakland during the summer of 2000. After this, another short break for the birth of kid number two was in the works. Once our quest resumed in 2002, we were off to Toronto to see the Blue Jays play two games in SkyDome. After dropping the kids off at Grandma and Grandpa’s in northeastern PA, we pointed the car north towards Canada. Instead of making the whole drive in one day, we stopped off in Buffalo to take in a minor league game, and then stopped for the night at Niagara Falls (on the Canadian side – there is much more to do on that side, for some reason). After a little sightseeing the next day, we continued on to Toronto. Once again, we had not made advance reservations, figuring it couldn’t be that hard to get a hotel room in a major city on a summer weekend. Everybody goes away for the weekends, right? Except that there was some sort of event going on that had everything booked up, and we ended up taking an interior room with no windows. I will never do that again! It was like sleeping in a crypt, it was so dark. You would think we would learn from these things. The first game we saw was on August 2, against the Baltimore Orioles. Scott Erickson was on the mound for the Orioles, and Esteban Loaiza was pitching for the Blue Jays this night. Neither pitcher would get a decision in this game. Erickson gave up 7 runs in three innings before being taken out. Loaiza left after 5 2/3, with a 8-3 lead. The Jays’ bullpen proceeded to cough up 6 runs, while the O’s pen had only given up one run. Final score, 9-8, with the win going to B.J. Ryan, and the loss to Kelvim Escobar. Looking toward the outfield, you can see the massive Jumbotron, which at the time was the largest video display in any ballpark. The inside of the open roof is still very imposing, and there are also hotel rooms that overlook the field! The Renaissance Hotel is attached to the stadium, and there are about 70 field-view rooms. There have been a number of instances in which the activity taking place inside of one of the rooms was much more interesting than the activity taking place on the field below. Remember to close your drapes, people! Chris Carpenter was pitching for the Jays, and Travis Driskill for the Orioles. Carpenter did not have a very good day, giving up 7 runs in four innings. Driskill got the win, and Carpenter the loss, in a 8-4 Orioles victory. In yet another casualty of corporate naming, SkyDome is now known as the Rogers Centre. Note the spelling – “centre”, not “center”. Remember, we’re in Canada! After this trip, there would be a three-year dry spell with no new stadiums visited. No, there weren’t any more kids being born! I don’t think there was a specific reason. Anyway, next time we will visit Tropicana Field, home of the Tampa Bay Devil Rays (they hadn’t been exorcised yet). Yesterday was not a good day in our house – my son was home from school for the day with a stomach virus. Blechh! As with most males, he was a terrible patient – moaning and groaning, telling me every few minutes how horrible he felt. Thankfully, today he felt much better, and is off to school. Suffice it to say, I didn’t get much done yesterday. So until I get my photos and information collected for my next stadium installment, I wanted to share one of my favorite photos from the past. As I go through my albums looking for photos to include in blog posts, sometimes I come across ones that I really like, but that don’t fit into any of my entries. One of the reasons I like it is that you can see his tongue sticking out. Although that just seems like a way to end up with one of those freak injuries – “Pitcher Bites Tongue While Slipping On Wet Mound” or something similar. Anyway, this is a shot from Spring Training 2007, of Adam Loewen, pitching for the Baltimore Orioles. Loewen was the Orioles’ top draft pick in 2002, and was a top pitching prospect in their system. He pitched well in this particular game against the Minnesota Twins, giving up one run on two hits in four innings, while striking out four. Problems developed later that season, and he ended up having surgery to insert a pin in his pitching elbow to stabilize a stress fracture. He attempted to come back in 2008, but again suffered the same injury. 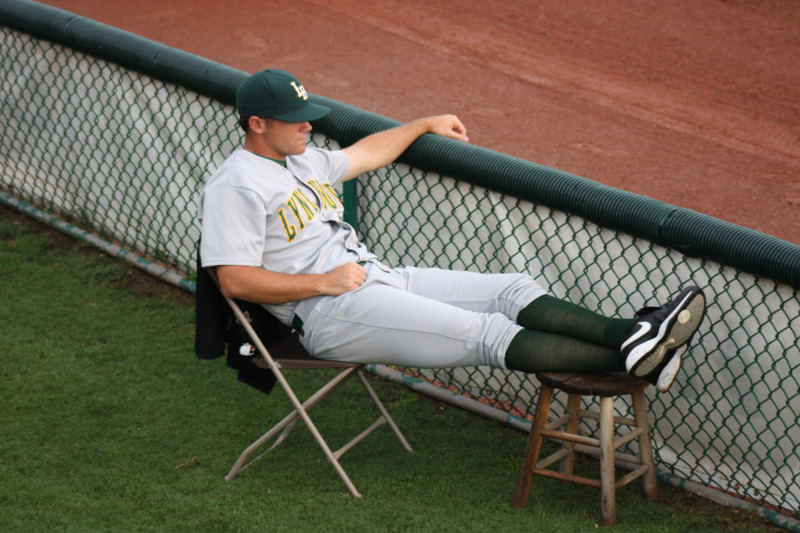 Loewen was released by the Orioles after the 2008 season, and was signed to a minor league contract by the Toronto Blue Jays. He has given up pitching, and is trying to make the transition to a position player. He is a non-roster invitee for the Jays this spring, as an outfielder. I will be interested to follow his progress this season, to see if he is successful. Best of luck to you! There is not much new going on right now in Phillies-land, as yesterday was an off day in the Phils’ exhibition schedule. Cole Hamels will get his first start of the spring later today, when the Phillies take on Team Canada in Clearwater. I’m really wishing I was there right now – I’m trying to type with frozen hands, as our propane is on its last molecules. We have the heat turned waaay down to try to conserve, and the propane people better get here NOW! They were supposed to come Monday, but the weather did not cooperate. They were then supposed to come Tuesday, but their truck was down for repair. “What kind of rinky-dink operation are we using, that they only have ONE truck? ?”, I semi-yelled at my husband this morning. He was not in the mood to hear it. I’ve mentioned previously that we have an ongoing quest to visit every major-league ballpark. So far we are two-thirds of the way there, having been to 20 of the 30 parks. It’s only taken 14 years J. Well, there were a few time-outs for having children. So in the spirit of the MLB Network’s “30 Clubs in 30 Days”, I offer up “20 Stadiums in 20 Days.” Okay, actually 19, as I’ve already written about my first visit to Veteran’s Stadium in a prior post. But hey, I can add Citizen’s Bank Park to the list, so that bumps it back up to 20! Obviously, the Vet was first on the list, being the Phillies home. Close proximity to Baltimore led to Camden Yards being number two on the stadium countdown. 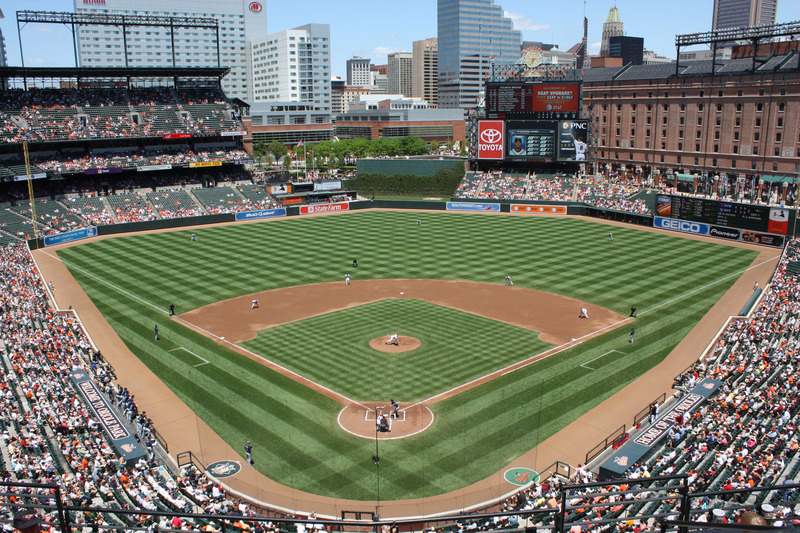 It’s full name is Oriole Park at Camden Yards, but I think most people just refer to it as Camden Yards, so I will too. Camden Yards opened in 1992, and pretty much started the whole “retro” ballpark trend. It’s very easy to get to; a quick exit from I-95 takes you almost directly to the stadium parking lots. You may remember Bo from his “Bo Knows” ad campaign for Nike, or from winning the Heisman trophy in 1985. He was the first athlete to be an all-star in two sports: he was an All-Star in 1989 for the Kansas City Royals, and appeared in the Pro Bowl in 1990 for the Raiders. I’ll also mention a couple other memorable games we’ve seen at Camden Yards. May 17, 1996 – Orioles vs. Seattle Mariners: this nine-inning game lasted 4 hours and 20 minutes! Several times during the course of the evening I suffered severe head bobs and missed an at-bat or two. But thankfully I was awake for what has to be one of the most dramatic finishes I’ve ever witnessed. In the bottom of the ninth, the O’s were down 13-10. The bases were loaded with two outs. At bat was Chris Hoiles, the only Orioles’ starter that night without a hit. Hoiles ran the count full, and then hit a walk-off grand slam to win the game, 14-13. May 30, 1997 – Orioles vs. Cleveland Indians: Mike Mussina took a perfect game into the ninth inning. Then Sandy Alomar, Jr. singled with one out to break it up. Mussina retired the next two batters to get the 3-0 victory. The entire stadium let out one huge collective sigh when Alomar got that hit. Mussina has flirted with perfection several times since then as well. Hopefully one of these days before he retires, he’ll finally achieve it. Check back tomorrow for the next ballpark on the countdown, Fenway Park. Update: Husband has just advised me that Mussina has already retired. Not sure how I forgot about that, seeing that he announced it last November. Oops!